Sometimes less is more, with the Contact binding from Union that's exactly what's going on. A soft flexing binding from the base, all the way up to the highback, make for a more playful and surfy feeling binding that you can take from the park to the peaks. An extruded aluminum heel cup makes for a lightweight and durable construction. Finished up on top of Union's Minimal Contact Footprint which reduces the over binding-to-board contact to a mere 5%, this enhances the natural board flex and gives the rider an overall better performance out of their whole set-up. Whether you are the park kid learning his first 270's or you are the seasoned vet who just like a softer flexing binding for the whole mountain, the Union Contact is the binding for you. This binding is one that pairs well with a playful all mountain board. It is just stiff enough to the point that turns are responsive at speed, but gives a surf-like feel that park riders love. Overall, this binding is awesome if you are looking for something that can hold up to abuse and can handle pretty much any terrain. 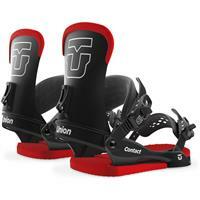 This binding is great for someone that rides park and wants a softer-flex binding for jibbing. It is supportive enough for general riding, though, and it is extremely comfortable. It also offers a good value. 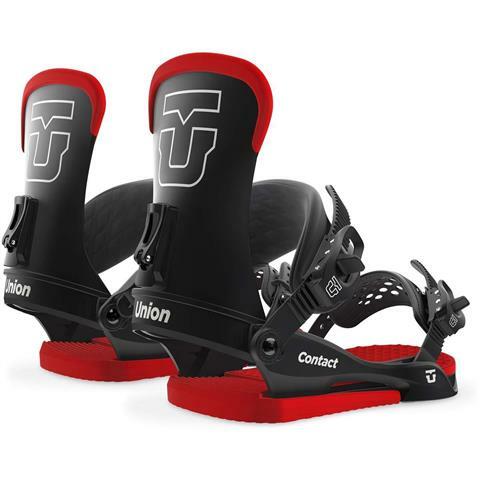 The Union contact binding is a amazing all mountain binding. very comfortable and will last you a long time.